Performers include: Charlie Hunnam, Mark Boone Junior, Tommy Flanagan, Maggie Siff, Ron Perlman, Kim Coates, Katey Sagal, Theo Rossi, Ryan Hurst, Johnny Lewis, William Lucking, Dayton Callie, Taylor Sheridan, Ally Walker, Winter Ave Zoli, Adam Arkin, Henry Rollins, Dendrie Taylor, Emilio Rivera, Jamie McShane, Marcos A. Ferraez, Mitch Pileggi, Callard Harris, Julie Ariola, Tory Kittles, Sprague Grayden, Nicholas Guest, Jay Karnes, Tara Macken, and Drea de Matteo. This dark and humorous drama follows the members of a notorious motorcycle club from Charming, California. The mission of the local Redwood chapter of the Sons of Anarchy (SOA) is to protect their simple town from advancing drug dealers and local corporate developers — while also making sure their illegal arms business continues to thrive. The group’s clubhouse is adjacent to the Teller-Morrow auto mechanic shop. Jax Teller (Charlie Hunnam) has great love for the brotherhood but feels conflicted by the club’s growing lawlessness. Jax has a child named Abel and that’s forced him to start looking at the big picture. Jax has an on-again, off-again romance with Dr. Tara Knowles (Maggie Siff), his high-school sweetheart who’s helped his son and friends with medical care. Wendy Case (Drea de Matteo) is Jax’s estranged wife, an addict whose drug use caused Abel to be born with birth defects. Jax’s mother, Gemma Teller Morrow (Katey Sagal), is a force-of-nature and schemer who’s married to the club’s president and Jax’s stepfather, Clarence “Clay” Morrow (Ron Perlman). He married Gemma after the death of Jax’s father. Clay struggles with his age and arthritis so he often lets Jax, his vice president, handle club affairs. Secretary/treasurer Bobby “Elvis” Munson (Mark Boone Junior) is Jewish and a demolitions and explosives expert. He’s also an Elvis impersonator who performs in Lake Tahoe. Alex “Tig” Trager (Kim Coates) is the club’s sergeant-at-arms. He’s one of the group’s more violent members, is closest to Clay, and doubts Jax’s ability to lead. Filip “Chibs” Telford (Tommy Flanagan) serves as the club’s medic for emergency backroom surgeries. He’s very loyal to Jax and previously served as a medic with the British Army. His estranged wife is Fiona (Bellina Logan) and, together, they have a daughter named Kerrianne. Harry “Opie” Winston (Ryan Hurst) is the son of one of the club co-founders, Piermont “Piney” Winston (William Lucking). A childhood friend of Jax, his mother Mary (Julie Ariola) took him away after her divorce from Piney. Opie returned to Charming and was later sent to prison for five years after a botched arson job with Kyle Hobart (Brian Van Holt). Kyle was ex-communicated from the group for abandoning him. Opie is married to Donna Winston (Sprague Grayden) and tries to earn an honest living. They have two children together and she begs him to leave the club. Juan Carlos “Juice” Ortiz (Theo Rossi) is the club’s hacker and intelligence officer. Though he has great tech skills, Clay sees him as unreliable and often gives him menial tasks. Otto “Big Otto” Delaney (Kurt Sutter) is imprisoned in Stockton state prison, serving time for second-degree murder. He’s the leader of the “Big House Crew,” a gang made up of imprisoned SOA members. Wayne Unser (Dayton Callie) is the Chief of the Charming Police Department and also owns a trucking company. He’s not above using the SOA for protection and various other questionable activities. David “Captain America” Hale (Taylor Sheridan) is the Deputy Chief and is known for having a squeaky-clean image and all-American good looks. He’s next in line for the Chief position and wants to purge the town of the SOA. Sheriff Victor “Vic” Trammel (Glenn Plummer) is the local county sheriff and is on the SOA payroll. Agent June Stahl (Ally Walker) is an ATF agent who’s investigating the club’s involvement in arms trafficking. A troubled Jax wakes next to Wendy and checks on Abel and Thomas before packing up his notebooks and gun and heading out. He goes to the storage unit and, after some reflection burns his notebooks, some photos and his father’s manuscript. He then goes to Teller-Morrow, looks at the burnt clubhouse, goes through some deeds in Gemma’s files and sees his father’s covered bike through the window of Gemma’s office. He leaves on his own bike. Next, he stops a Opie’s grave (where he leaves his SO-NS rings) and then Tara’s tombstone. He kisses it and leaves his wedding ring with his deceased wife. He visits Red Woody and and shares a sweet moment with Lyla. T.O. is welcomed to the club after the racist bylaws are changed. The group set out to find Connor to take him out, per Brendan Roarke. As Jax is about to kill Connor, he takes out Brendan instead as a nod to a tie that his father tried to sever 20 years earlier. We learn that, now that the charters know the truth about Jury’s demise, a mayhem vote has been called and it seems that Chibs and SAMCRO have been instructed by Jax to vote “yea.” The die is cast. Jax Teller will meet Mr. Mayhem. Later, Jax talks with Nero and shows him the paperwork that will allow Wendy to take ownership of his property — which she is to sell and move back East (anywhere but Charming). He shares a tearful farewell with Thomas and Abel and assures Wendy that all will be fine. He meets with D.A. Patterson and tells her the truth about Tara’s murder and records a confession which covers Gemma’s actions, Juice’s cover-up, and the violence with the Chinese. He lies and tells Patterson that Gemma is in Oregon with Unser and promises that the violence will be over by the end of the day. Jax leaves and shoots Barosky for the info he gave the Chinese. He uses a blanket from the homelesss lady to hide under the courthouse stairs. He lays in wait for Marks who’s been released on bail and shoots him. It’s not long before an APB goes out for Jax. He goes back to the club and removes his president’s patch. Chibs turns over his VP duties to Tig and Jax gives Chibs his patch. Jax puts his gun on the table, saying that he’s ready, but Chibs shoots Happy in the arm instead. They hug goodbye and Jax leaves. He stops at the spot where his father was killed and delivers a monologue, apologizing for not living up to what was expected. Followed by more than 20 police cars, Jax kills himself by driving into an oncoming Papa’s Goods truck — driven by Milo. He has died just as his father had. First aired: December 9, 2014. What do you think? 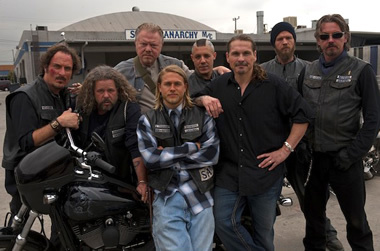 Do you like the Sons of Anarchy TV show? Do you think it should have ended or should it have continued for an eighth season? This is such an amazing show. I’ve watched the entire series in Netflix at least 10+ times in addition to turning my friends into major SOA fans. What I do not understand is why is Netflix doing away with SOA series. Can someone please tell me why I cant watch this series after December 1, 2018? GREAT show….it’s real good to see…. it all works so well…..
now JAX is swinging a sword…in…KING ARTHUR…..another well done…piece of art……….. This is a show that should come back!! Too bad it ended…all time favorite! Sons of Anarchy is a show for all Harley lovers hands down! The climax is perfect in lieu with the tone of the show and the ongoing plights in Max Teller’s mind. Once a SAMCRO always a SAMCRO. it is one of my all time favorite shows and when i watch i feel like i am living inside the show! I cant stop watching because it is so good i cant wait to see what happens next! I was sad to see it end… In spite of the violence, it was an entertaining and wonderful show & cast. Loved the show and characters. Can’t believe it ended, broke my heart. I could have gone on watching this show for a long time. I think it had potential for many future shows but the shows execs didn’t think so. Will miss them all.